Born and entirely manufactured in the state is Crescent Moon Gold 10. The company claims that the manufacturing process is all supported by wind power and free from any PVC. But more than just being “green” gears, this snowshoe packs some punches too. Labeled as full-blown backcountry snowshoes, Crescent Moon Gold 10 is designed to handle various terrains. From heaps of deep fresh powder to step icy slopes, these snowshoe are engineered to stand up to extreme conditions. The teardrop shaped frames extend quite widely around the toe but tapering sharply to the tails. This allows for high flotation rating while not necessarily compromising the maneuverability. There is a lot more to adore from this snowshoes and you’ll know soon in this review. 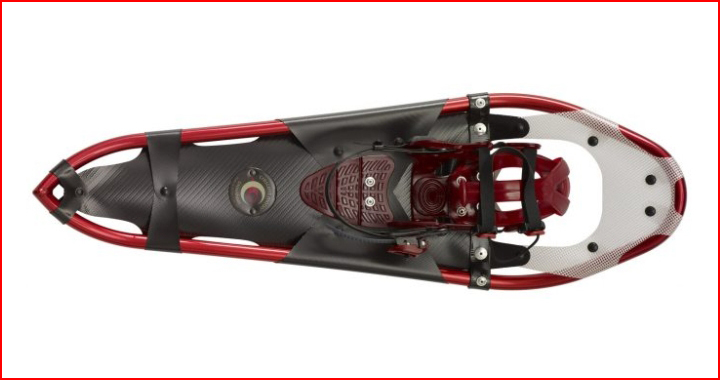 All Crescent Moon snowshoes come with the company’s trademark teardrop-shaped frames, not excluding the Gold 10 Series snowshoe. In this model the frames are 32-inch long and 10-inch at its widest point. With such large footprint, the snowshoe can take on total weight load of 225-pound before it starts to sink. That large footprint also means that this snowshoe is supposed to be used on open backcountry drifts where you’ll likely run into fluffy soft powder. You can try to take it for trail walking but you might get difficulties due to its oversized frames. You will need to adjust your walking form significantly, otherwise, the snowshoe will bump into each other. As long as the durability is concerned, Crescent Moon Gold 10 snowshoe is among the toughest models you can get. Its rugged aircraft grade aluminum tubes are TIG welded and powder coated. Not only will it last a few winters but you can bet it’ll keep looking new for a long time. No more ugly paint scratch. The traction system on Crescent Moon Gold 10 has been upgraded from its last iteration, now featuring more cleats under your forefoot. The too crampons work hand to hand with the solid steel claws (which were non-existent in the previous model) under the balls of your feet, digging and shoveling the snow to provide firm grip as you ascend. 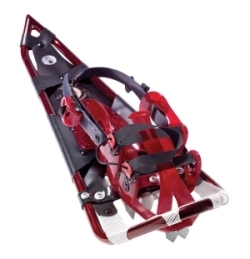 It has a heel crampon too that comes in handy as you descend. To prevent slippage as you go side hilling across the slopes, the snowshoe is equipped with traversing claws too. You know it’s very tricky to stand and walk at an angle on long traverses if you don’t have enough horizontal traction. The said claws solve this problem. Featuring double rubbery straps that can be fastened with a single pull, the bindings on Crescent Moon Gold 10 can’t be any easier. On top of that, it fits wide range of boots of all sizes. You can slide in your favorite hiking boots or even heavy duty Pac-style winter boots, and the binding can fit them just fine. At the back, the heel wraps come with ratchet-style buckle. You’re going to take some time to learn how it works, but it’s nowhere to being daunting. As a backcountry snowshoe, it’s interesting to find that Crescent Moon Gold 10 comes with fixed rotation binding. Basically, this type of binding connects the foot rest area to the deck using flexible straps that prevent it from rotating freely. It’s best used on-trail where the terrain are mostly flat. You can move fast with this type of binding. In backcountry setting, however, you will likely run into more challenges. The terrain varies by much and there is more loose snow to deal with. If you don’t adjust your walking form, chance is the snowshoe will frequently sling snow on your back. In addition to the double straps that can be secured with just one pull, the bindings also have these plastic prongs right in front of it. They act as a guide to better position your feet as well as a double security, in case your feet will ever slide forward. Don’t get it wrong. The straps alone are actually enough to secure your feet in place. But having such an extra measure is never a bad idea if you wander off through the backcountry. Still not convinced? Find out how Crescent Moon Gold 10 snowshoes fare compared to other snowshoes in our list Top 10 Best Snowshoes of 2017.